1. In a large skillet on medium-high heat, add 1 tbsp olive oil and cook the ground chicken. 2. In a separate skillet on medium-high heat, add 1 tbsp olive oil and saute the chopped vegetables (peppers, onion, mushrooms). 3. When the chicken is cooked thoroughly (no pink throughout), add the vegetables into the large skillet and the canned diced tomatoes. 4. Cook on low-medium heat, add in spices/the rest of the ingredients, allow to simmer on low for at least 20 minutes. 5. 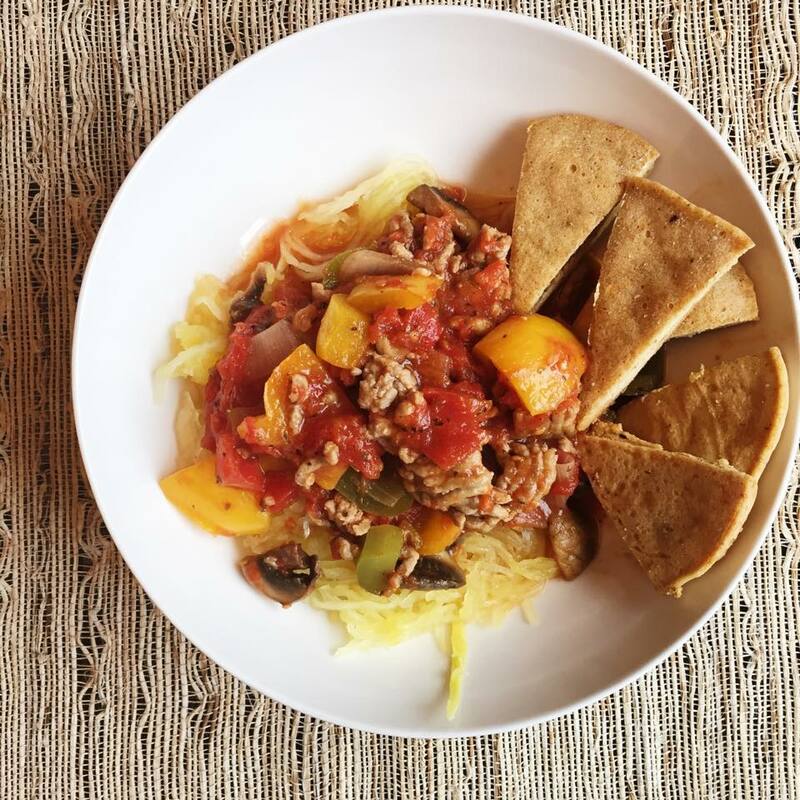 Enjoy topped on spaghetti squash. Health tip: if you are a pasta person and not a squash person – choose a quinoa, brown rice, or whole grain pasta to serve this with. These types of pasta have more nutritional content and a higher satiety value (leaving you full longer) versus a white pasta. If I were to choose a pasta with this sauce, I would choose a brown rice pasta as it is lower in fat and protein content than the quinoa pasta. Since this sauce already has a protein component (chicken), the additional protein is not as necessary. If this was a vegetable/vegetarian sauce and made without the ground chicken, I would choose quinoa pasta for the higher protein and satiety component. Sounds great for a weeknight dinner!